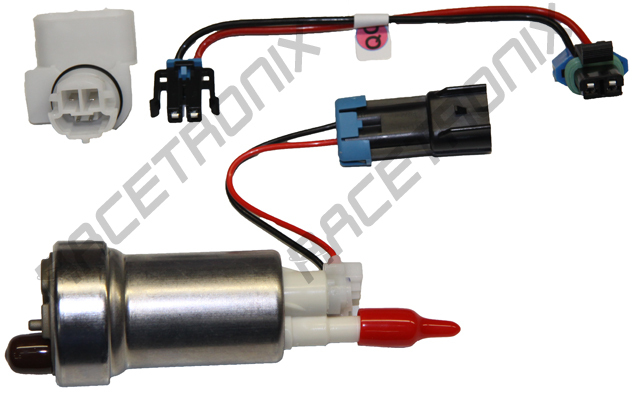 In-tank Harness, MP280 2W>DCSS E85 8"
This harness is designed to connect a Walbro 430LPH E85 fuel pump (shown below) to a Delphi (GM) 280-series bulkhead connector found in most 2004 and up GM SUV fuel pump modules. 8" wire length will fit the tallest of Delphi modules. Heavy-gauge wire supports power requirements of the HP pump. This in-tank harness should be used with our FPWH-022 G.M. SUV fuel pump upgrade harness. Bulkhead connector and pump not included.